There is much debate about whether the tax rates should be kept low or raised. This is the wrong debate. Instead we should be deliberating whether we need to reform our economic system. If our markets were free of oligopolistic control we would have a wider distribution of income and income taxes with the result of more tax revenue going to the government with lower rates. The republicans speak with pride how the free market system is the best economic model for increasing the living standards of the nation and the citizens of the country. They resolutely proclaim that government needs to cut back on regulation and allow the free market to work. This is hard to argue against. Below is a chart comparing tax rates and percent of taxes collected in 1979 to what Congress passed during the "Fiscal Cliff" crisis. As a result of these changes 99.3% of households will not experience any changes in their income taxes. 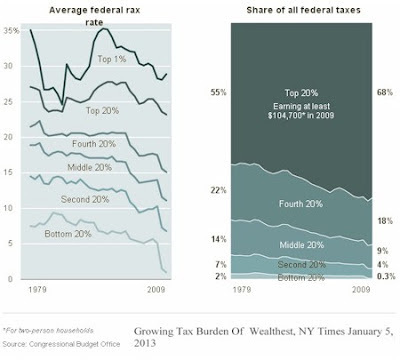 The top 20% will be paying 68% of the federal taxes collected, compared to 55% in 1979. I do not understand why most free market advocates are not up in arms over industries being taken over and controlled by a small group of firms. This is a major part of the income equality problem that is seldom discussed.